This page shows the quilts made by Piece Partners of Perth for the project, and song verses made by Christine and Ewan. The quilts will be exhibited in Errol, St Madoes and elsewhere. Cross stitch or needlepoint, which one tae start? Anglers have fished on the River Tay for centuries, competing for the catch with all the bird life that inhabits its banks. I like to inject a bit of fun into my blocks, hence the name and content. 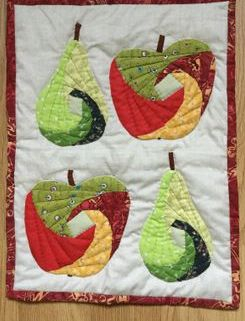 The block was machine pierced and hand quilted. Heat “n” Bond was used to attach the heron and plants. The Pow Burn was made in the 14th Century to feed the Lade which in turn powered the mills in Perth. The Lade also formed a defensive moat around the town before going into the Tay. My quilt shows the Burn in the Middle Ages with Perth and the Tay in the background. The lade runs across the left hand side of the picture which also includes the Huntingtower. I have tried to make my quilt look like a medieval picture. The background fabric resembles old parchment. I have hand appliquéd and quilted the piece and finished off the small details with embroidery. 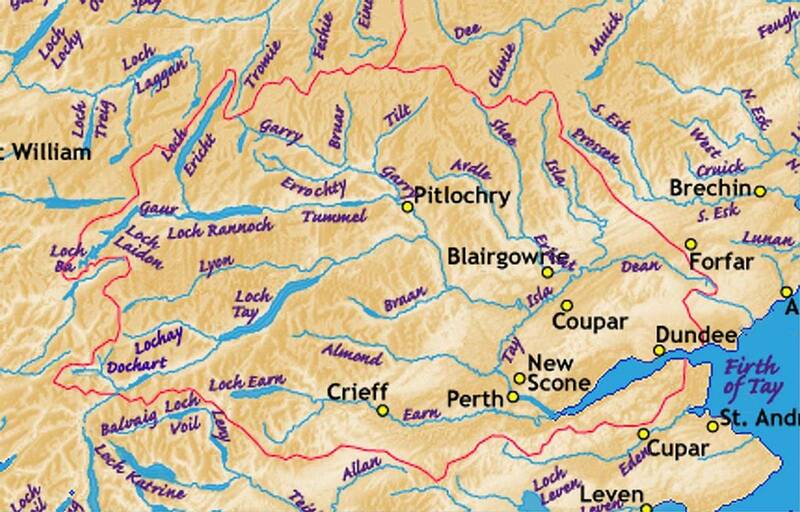 Dutch dykers were employed in the Carse of Gowrie in the 1800s to reclaim land from the flood plains of the River Tay. They used straw, ropes and wooden poles in their work. The reclaimed land proved to be very fertile and is idea for growing a variety of fruits, especially apples and raspberries which are used nowadays in local wine making and jam production. The Old Schoolhouse in Cottown is thought to have ben constructed between 1745 and 1770, the rubble plinth possibly being the remains of an earlier sandstone building destroyed by fire in 1766. The Cottown Schoolhouse is constructed out of traditional wattle and daub walls and thatched with reeds from the nearby and extensive reed beds on the River Tay. The Old Schoolhouse is now owned by the National Trust of Scotland. The panoramic local view along the north stretch of the River Tay shows, with a little artistic licence, Kinnoull Hill and Elcho Castle. This piece of work was created as a contribution to the Tay Landscape and Piece Partners point project and was based on a painting of the area by my husband. The Tay, the Tay, the silvery Tay, it flows from Perth to Dundee each day. My favourite view of the river is from the Kinnoull Hill tower, looking east towards Dundee. The inspiration for this Landscape was childhood memories of looking down at the Carse of Gowrie from the tower on Kinnoull Hill. I used to think it was the top of the world! I used brusho paints in crystal form, by spraying them with water the colour spreads out. I also machine quilted- free motion style. 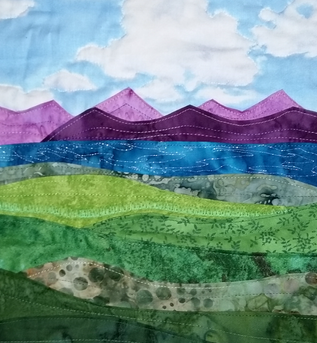 This Landscape quilt is a representation of the tower on Kinnoull Hill and the Carse of Gowrie. On an outcrop a few hundred yards to the east of the summit of Kinnoull Hill is Kinnoull Tower, built in 1829 by Lord Grey of Kinfauns. Grey saw a great similarity between the River Tay and parts of the Rhine. Inspired by the castle on the Rhine, he built the tower asa romantic folly and also used it as an observatory. The part to the tower is close to the edge of a high and dangerous cliff, though this is partly hidden by the trees. There are occasional gaps which allow dramatic views down to the Tay and the A90 far below, with the Lomond Hills and Fife beyond. The cobble boat ferry was used on the River Tay at Jamesfield and at Cairnie Pier. My interpretation of the cobble boat ferry was machine pierced and hand quilted. Foundation pieced then hand appliquéd and hand quilted. The tune is a Dutch kid's song about ducks swimming in the water, polderman is dyke builder, schoon flats are beautiful flat lands. Up the road from Abernethy School there’s a tower. Tall and pointy. At the top there’s a golden fish and it shows which way the wind blows. Go to the museum and get the key. It's 25 centimetres. Unlock the door and climb the steps and see the muckle great bell. Up the ladder to the heavy trap door. Its pitch black, dark and scary.